Tong Jia Di needs a life besides work, paying down family debt, and more work. So her best friend Jiang Xiao Nan sneaks in a “Love” coupon in Jia Di’s raffle box praying that the lucky guy who draws it will sweep Jia Di off her feet. As it so happens, Huo Yan, the compassionate manager Jia Di has secret crush on, is the lucky guy. But, tho' the prince can exchange the coupon for Cinderella’s love, it doesn’t mean he will, especially when his devilish younger brother is determined to exchange his “Master/Angel” coupon for her servitude. SO SWEET!!!!!!!!!!!!!!!!! AWWWWWW!!!!!!!! LOVE THE ENDING!!!!!!!!!!!! where are the rest of the episodes? there should be more. i agree…definitely not as good as devil besides you. this reminds me a little bit of Meteor garden. one boy ignores her presence /rude to her while the other boy exhibits gentleness/kindness. this is light, fun and entertaining. much better than devil beside you, in my opinion. enjoyed it so much! their quarrels are more than in Meteor Garden. hahaha. agreed!!!! his character in devil beside you was.. charming. exactly the same charisma as jerry yan in meteor garden. Mike He acts better than Jerry Yan though, in my opinion. I like both of them, but Mike He’s acting, especially in this drama, trumps Jerry Yan’s acting in any drama. the last few episodes are so emotionally tiring. the series metamorphed from plain fun to heavy drama, which i don’t like because i find the sadistic-masochistic interplay between the 2 lead characters unnecessary. in my opinion, why inflict hurt/ pain to each other when it can be avoided by him telling her of his condition. together, they can pull through the bad experience and if HuoDa dies(i don’t know for sure since i’m at episode 14), JaDi might have conditioned herself and accept the outcome of his disease. i might have given this a very high rating, at par with Meteor Garden(my favorite drama seriesZ) had it cut off many scenes similar to MG and the exclusion of the sudden turn of events, from light funny to heavy drama.generally, I don’t go for scenes that make me cry, but the last few minutes of Part 6 Last episode SAVED the day. I was so touched with it that i forgave the about-face change of HuoDA towards JiaDi, hoping that by putting her down, she would leave him for good. that was what he was expecting once he knew he got wilson’s disease. is episode 6 & 7 switched? DOES MIKE HE DIE :O in this drama ? OMG It’s over… This is my second time watching the drama, and there will no doubt be a third. Mike is amazing, and I feel like I’ve fallen in love with him myself. I always do this. I watch a great drama and I fall in love with the main actor, and when the drama’s over, there’s this sad, nostalgic feeling. Just completed watching the drama second time and still felt excited about it. Love Mike and Kingone……..don’t mind watching it again for the 3rd time. I was disappointed that Kingone has the second role. 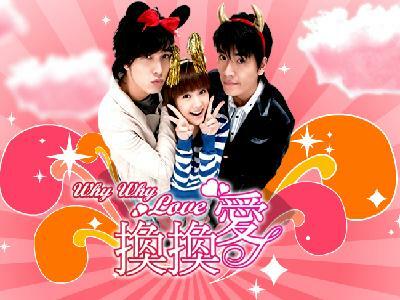 I liked him and Rainie in this drama!